'More than Moore' and 'more Moore' are today's buzzwords driving the microelectronic industry. 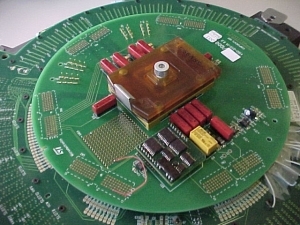 Advances in process technology allow engineers to create circuits with growing complexity and offering increasing functionality on smaller surfaces. Hans Manhaeve reports. Although the fab investments are sky high, the transistors produced today are nearly for free. Market pressure forces the use of a manufacturing process long before they are mature, resulting in systematic and random defects, requiring appropriate test processes to ensure that the end product meets both functional, quality and reliability requirements. This requires that all building blocks (and, in the end, every single transistor) and their interconnections are properly tested, making test an important factor of the product cost that is directly related to product complexity. Unless appropriate solutions are deployed, soon test will become the dominant product cost factor. In contrast the market is equally demanding for cheaper and better electronics. So the questions that need to be addressed are: how to minimise the cost of test? How to avoid test escapes? How to avoid false rejects? What can be done at design level to ease test efforts and reduce the cost of test? Can Iddq serve? Test is commonly seen as a cost and a necessary evil. "If my design is perfect then I don't need test," is a common expression. However, even for a perfect design test is necessary, at first to validate that the design is correct (a process which is commonly called validation but that is actually a test step) but, more importantly, to assure that it has been correctly manufactured, as the manufacturing process itself is imperfect. Taking that into consideration, test is actually a value factor rather than a cost factor. Test is an important part of a production process as to assure a proper working product. Without test there is no product and without a product there is no value. Test further enhances the value of products by improving their quality, better tests simply mean better product quality. Higher quality products command higher prices, find more loyal users and the benefits go on and on. Considering market demands, and to further enhance the value of test, there is a need to provide high-quality test results cost effectively. Deploying test to identify manufacturing issues is quite similar to wildlife observation: it requires to be at the right place and look in the right direction at the right time, have a good set of binoculars, know how to use them and keep them steady. From a test perspective this means: apply the proper test conditions, make use of the right test instrument and ensure reliable and repeatable test results. For electrical circuits there are three main parameters to observe: voltage (logic/functional behaviour). Supply current test in general and quiescent current (Iddq) tests in particular are known to be one of the cornerstones of the test suite for today's ICs. The symbol 'Iddq' has a double meaning. It is used to refer to the quiescent supply current and to refer to a test based on taking quiescent supply current (Iddq) measurements. The Iddq flows when the device is in a stable state, and equals the leakage current for logic structures or the combination of leakage and bias currents in the more general case. Iddq (as a test) offers a screen that allows quick identification of defective parts, during both wafer and final test. It has been proven that Iddq tests improve defect detection at less costs than when extending other methods, they offer cost/quality optimisation perspectives and are applicable both at probe (wafer test) and final (packed device) test. When properly combined with screens such a voltage stress, Iddq is able to replace burn-in at only a fraction of the burn-in costs, assuring the same and even better device reliability. A proper combination of voltage and current tests leads to highly compact but very efficient test screens allowing to considerably cut down on test costs. To support the application of current test to today's and tomorrow's products and offering the capability to exploit current based test to its full extend, Q-Star Test has been developing current measurement instruments that allow users to make current measurements, both very fast and with very high measurement repeatability. The Q-Star Test products are compact, high performing intelligent instruments that are typically positioned on the interface board that links the device/system to be tested with the automated test equipment (ATE). These instruments are designed to be non-intrusive (transparent to both ATE and the device being tested), are ATE independent, easy to use and do not influence the test conditions. For the ATE they look as being part of device being tested and from the device perspective they look as being part of the ATE. These instruments provide test system independent Idd/Iss measurement solutions, extend test system functionality and shorten test times. Q-Star Test' static/quiescent current measurement instruments (also referred to as Iddq or Issq modules) serve a wide range of applications: standard and advanced Iddq tests; stand-by current measurements; power-down current measurements; bias current measurements; average current measurements; analogue dc and low frequency current measurements. Equally, Q-Star Test's dynamic current measurement instruments (also referred to as Iddt modules) serve a wide range of applications: dynamic and transient (Iddt) current tests; power profiling of circuits and systems; active current consumption; E-fuse programming validation. Instruments embedded in ATE equipment typically are offering a measurement resolution/repeatability which is about 0-0.2 per cent of the measurement range, limiting the detection of small defects in the presence of large background currents. Q-Star instruments in contrast offer a measurement resolution/repeatability of 0.01 to 0.001 per cent of the measurement range, enabling the detection of subtle defects even in the presence of large background currents. As an example, customers applying Q-Star instruments have demonstrated the capability of being able to reliably detect variations of 20µA on top of 10A of current in a production test environment. ATE embedded current measurement instrumentation is also impacted by the Iddq settling time needed to assure reliable and repeatable measurements. As a result ATE instrument based current measurements typically require 10-100ms/measurement, limiting the number of measurements/tests that can be deployed from an economic perspective considering a given test time budget. In contrast deploying Q-Star measurement instruments only requires 100 to 150µs to make the same measurements with even much higher precision. Making use of Q-Star's compact and advanced instruments offers improved measurement resolution, better measurement repeatability and much shorter test times in comparison to using ATE-based solutions. In addition to that, their on-board data processing capabilities easily support advanced Iddq strategies and data storage. Having the ability to make fast and reliable current measurements allows rethinking test strategies and to make optimal use of combined and simultaneously deployed voltage and current based test strategies. Experiments have shown that combining a proper vector generation strategy with add-on measurement equipment yields test programmes that in average offer a 0.6 per cent to 3 per cent total fault coverage increase, require only 24 per cent of the ATPG time needed, require only 40.5 per cent of the stuck-at only vectors needed and yield up to 48 per cent test time reduction when compared with the 'standard' approach deployed today.